Whining & howling, panting, trembling, hiding, cowering, restlessness, and excessive owner seeking are all reactions to stressful situations. Comfort Zone with D.A.P. Diffuser dispenses an odorless vapor that mimics a dog''s natural calming pheromones. This vapor signals to your dog that he is safe and secure, reducing your dog’s unwanted behaviors. 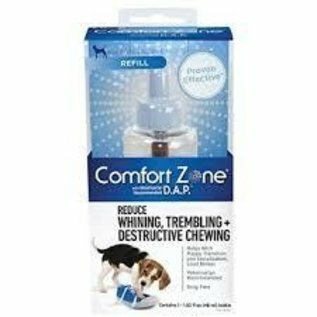 Comfort Zone Products with D.A.P. are clinically proven* to help reduce stress behaviors resulting from loud noises and new pet adoption.